On the Segara Wedi sand plain sits a Hindu temple called Pura Luhur Poten. 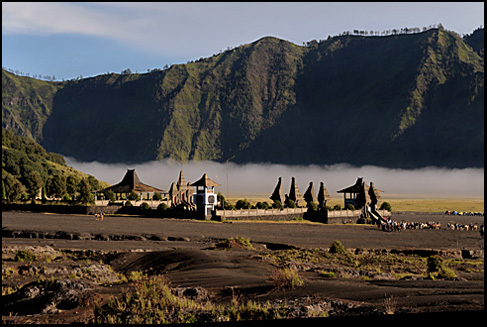 From the edge of the Bromo peak, you can see more or less in the middle of the Bromo caldera, this temple. This view gives you a good sense of how large the site is. 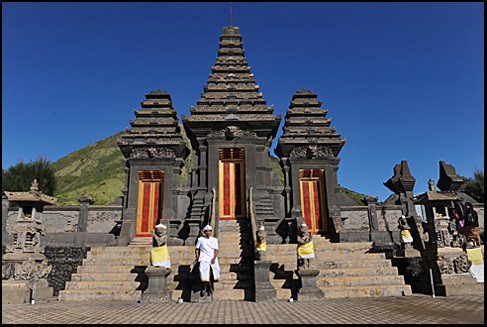 Pura Luhur Poten holds a significant importance to the Tanggerese tribe who scatter across the mountainous villages. As the decline of Majapahit Kingdom dawned upon these people, they emphatically moved to the outskirts of the volcanoes, which inaccessibility was their greatest asset to fend off any foreign intrusions, especially by the Muslims and Christians. Until today, the Tanggereses are isolated from the rest of the world. While the majority of Javanese profess the religion of Islam, this unique tribe still retains their beliefs from the ancient days of Majapahit. In fact, the name Tangger (used by the tribe as well as the massive caldera) was originated from Roro Anteng, the daughter of Majapahit’s King Brawijaya, and Joko Seger, a Brahmin caste, who got married and eventually established Purbawisesa Tangger region under their ruling. The Tanggereses actually subscribe to the teachings of Mahayana Buddhism, but added to that are the elements of Hinduism and Animism. Nonetheless, it is OK to refer them as Hindus because the smorgasbord of religious influences is really not worth the time to think it through. 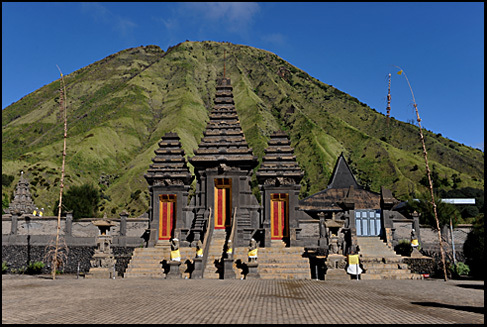 In fact, in Pura Luhur Poten, the Tanggereses worship Ida Sang Hyang Widi Wasa (or the Big Almighty Lord), along with the Trimurti gods (Shiva, Brahma and Vishnu). This pura plays host to the annual Yadnya Kasada ceremony. The event lasts for about 1 month, which, on the 14th day, the Tanggereses will congregate at Pura Luhur Poten to ask for blessings from the God of Mahameru (Mt Semeru). 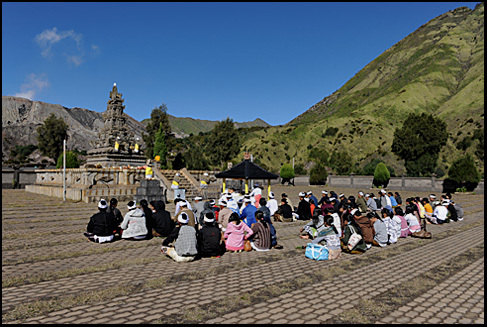 Then the mass will proceed along the crater edges of Mt Bromo where offerings of rice, fruit, vegetables, flowers, livestock and other local produce will be thrown into the deep gully. 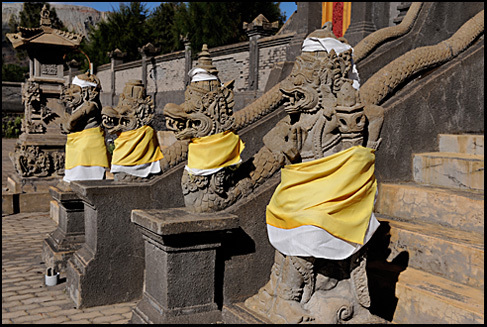 The major difference between this temple with the Balinese ones are the type of stones and paints used. Pura Luhur Poten uses natural black stones from the many volcanoes nearby, while Balinese temples mostly have orange paints at various sections. Inside this pura, there are several buildings and enclosures aligned in Mandala composition. Man, you travel to some incredible places. You’re certainly living the good life! Incredible photographs. Thanks for continuously sharing images from around the world to those of us who may not be able to travel as much as we’d like at the moment. As someone who lives in Indonesia I feel ashamed for not having visited this place. I must say that the way you take the photographs are quite unique and offers something rather different from other travel blogs. Great work!